Stylish, durable, and functional this Outsunny 10' large patio umbrella provides lasting full coverage shade while adding a touch of elegance and class to any outdoor setting. A solid aluminum pole and 6 strong flexible fiberglass ribs easily hold the UV and water resistant 180g polyester canopy to provide many seasons of shade and cover. A convenient hand crank and push button tilt mechanism create a user friendly, versatile umbrella system that anyone can operate. ✔LARGE STYLISH DESIGN: This large 10' stylish patio umbrella has a round top polyester cover that will provide ample shading and is perfect for both residential and commercial locations. ✔ ALUMINUM FRAME WITH 6 FIBERGLASS RIBS: A rust-resistant aluminum pole with 6 fiberglass ribs supports a UV resistant 180g polyester cloth canopy will last for many seasons of use. 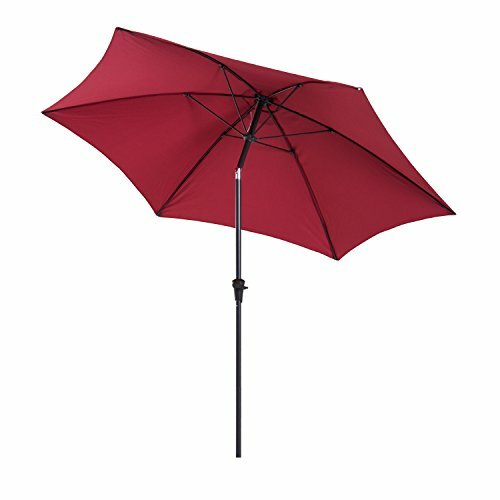 ✔ CRANK MECHANISM: Open and close your umbrella in seconds with the easy-to-turn handle located on the side of the powder-coated aluminum pole. ✔ THREE-POSITION TILT: Quickly adjust your umbrella's angle with a simple push button control that allows you to continue stay in the shade as the sun moves across the sky. ✔ UV AND WATER-RESISTANT: UV and water-resistant polyester fabric helps prevent molding and fading that comes from typical outdoor use.